Britain could be hit by 70mph winds from a hurricane crossing the Atlantic Ocean that is forecast to arrive on our shores on the 30th anniversary of the 1987 Great Storm. 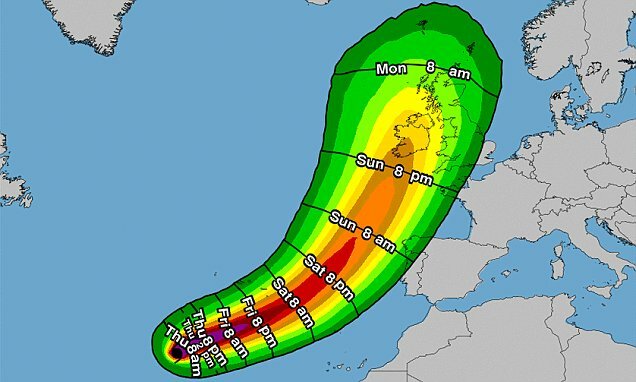 Hurricane Ophelia was upgraded from a tropical storm overnight and the US National Hurricane Center warns it could strengthen over the coming days, with the remnants looking set to reach the UK on Sunday and Monday. The volatile weather system could bring heavy downpours and gusts of up to 70mph when it hits Britain's shores at the start of next week, with the Met Office warning that the unsettled weather is expected to cause disruption. The west of Britain will see the worst of the weather, with winds of 60mph to 70mph forecast. The NHC said last night that Ophelia was 760 miles south west of the Azores and packing maximum sustained winds of 75mph. The strong winds are expected to arrive after a possible 77F (25C) heatwave this weekend that will see hot air pulled up from southern Spain that will bring conditions more associated with summer from tomorrow. The warmth is also being fuelled by the remnants of Hurricane Nate and will provide a respite for North West England which was under a weather warning yesterday, with up to 4in (100mm) of rain forecast to fall in Cumbria. Met Office forecaster Alex Burkhill said today: 'Ophelia became a hurricane overnight and the forecast track takes it eastwards towards Iberia for the weekend.